The News with Huey Lewis, and although they say you can never go back in time, we do - with 5 video clips of classic Huey Lewis and The News hit songs: I Want A New Drug, The Heart of Rock and Roll, The Power of Love, Back in Time, and While We're Young. Born Hugh Anthony Cregg III in New York City on July 5, 1950, talented and smart Hugh grew up in California (near San Francisco) and zoomed through elementary and high school, skipping second grade. 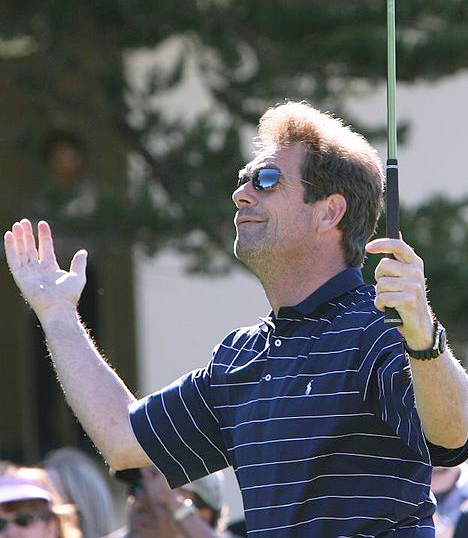 Huey Lewis has said he loved the outdoors as a kid and that he and his father went fly-fishing; something he still enjoys today. After his parents separated (he was 12) Hugh attended a New Jersey prep school - Lawrenceville School - where he scored a perfect 800 on the math SAT in 1967, and became an all-state baseball player. Encouraged by his father to take a year off, at age 16 Huey Lewis hitch-hiked across America to New York City, where he stowed away on a plane to Europe. Lewis toured around Europe (hitchhiking again) and played on street corners and bus stops for almost a year, honing his harmonica skills. Once back in the U.S., Hugh enrolled in the engineering program at Cornell University in Ithica, New York in September 1969, and even joined the Eta Lambda Nu fraternity in September 1969. He joined the local band Slippery Elm December that year, but six months into college he dropped out and moved back to California where he'd grown up. Lewis worked odd jobs while striving to break into the music business. His name change to Hughie Louis came about in 1971 when he joined the San Francisco group Clover, singing lead vocals and playing harmonica...and meeting future News keyboardist Sean Hopper. While on tour in Europe with Nick Lowe, Clover (with Hugh now going by Huey Lewis) cut two albums for the Phonogram label, with producer "Mutt" Lange (Robert John Lange). The albums went nowhere, and when Clover returned to California in 1978 the band broke up. Huey met the other future News band members while playing clubs in the San Francisco area where he'd grown up; on the side he played harmonica for Thin Lizzy on their 1978 Live and Dangerous album. Huey Lewis and the American Express was formed that year and landed a contract with Phonogram Records; Bob Brown became Huey's manager. The band started to see some success, opening for Van Morrison and changing their name to Huey Lewis and the News at Bob's recommendation. Their first album in 1980 tanked, but their 1982 album Picture This had their first Top Ten hit single Do You Believe in Love (written by Mutt Lange), and the album got to #13 on the charts. Below from left, Huey Lewis & the News c 1983: Bill Gibson, Johnny Colla, Sean Hopper, Huey Lewis, Mario Cipollina, and Chris Hayes. 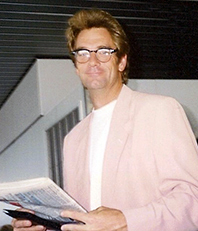 Huey Lewis and The News were back to touring small clubs in 1983 by the time their Sports album was released. By 1984 Sports had gone platinum, hitting #1 on the album charts and selling over 10 million copies. 4 singles from Sports hit the Top Ten Billboard Hot 100, including the mega hits I Want A New Drug and The Heart of Rock and Roll. 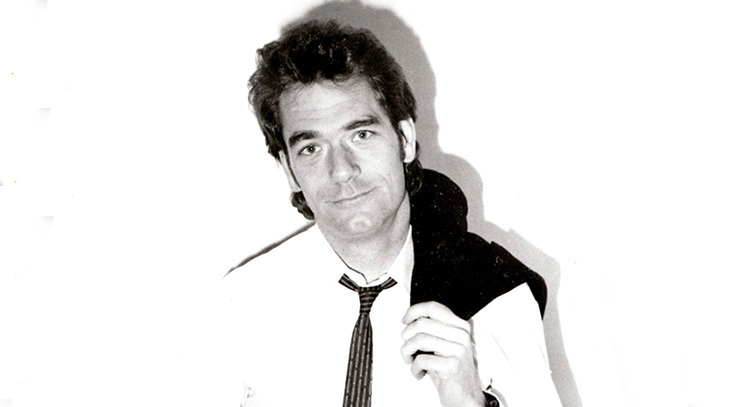 Below, the official music video for I Want a New Drug, performed by Huey Lewis and the News. 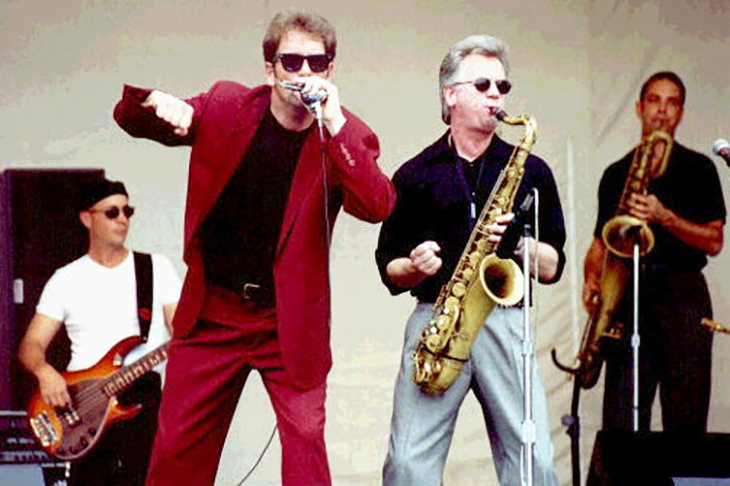 Huey Lewis and the News performing The Heart of Rock and Roll in the official music video for the hit song. Also in 1983, Huey Lewis married his manager's secretary, Sidney Conroy; together they had daughter Kelly (1983) and son Austin (1985). “I got married in 1983 to my wife, Sidney, in Hawaii—we separated after six years, but we’re still pals. I was over there with my wife-to-be, her mother and sister. They wanted to sit on the beach all day. So I went to Kapalua, rented some clubs and I was hooked. I played baseball as a kid so I had a little hand-eye coordination going for me." Today Lewis and Sidney are still separated (not divorced), and he's still a keen golfer, playing in Pro-Am golf tournaments in the U.S. (ie, 2015 Pebble Beach) and St. Andrews golf course in Scotland. 1985 was (mostly) a great year for Huey Lewis. He had a small role as a teacher in the hit movie Back to the Future (1985). Below, Michael J. Fox auditions and Huey Lewis passes judgement, in the "battle of the bands" scene from Back to the Future. The Power of Love and Back in Time by Huey Lewis and the News were hits from the soundtrack album for the Back to the Future film. That same year, Lewis also produced songs for Nick Lowe and Bruce Hornsby & The Range; and the band performed on the We Are The World single. Huey Lewis also sued Ray Parker Jr. for similarities between Ray's Ghostbuster's movie theme song and I Want A New Drug; they settled out of court. The Power of Love (nominated for an Academy Award) below, performed live in 1987 by Huey Lewis and the News. Back in Time, also being performed live in 1987 by Huey Lewis and the News. 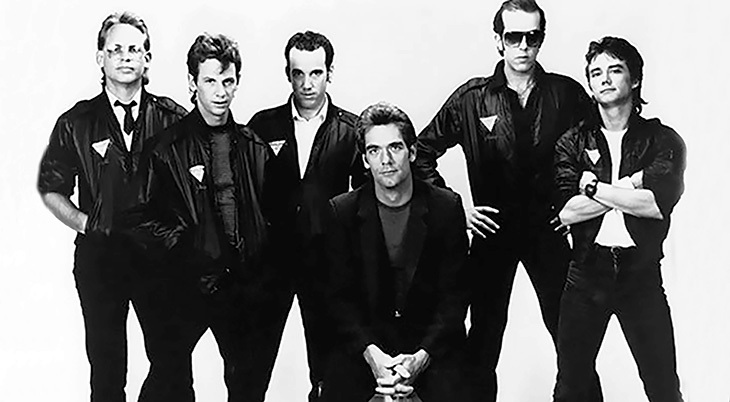 Since releasing the album Fore (1986) which went platinum, Huey Lewis and the News have continued to tour and cut albums at the rate of approx 2/decade. Huey Lewis (and the News) ninth and most recent studio album was 2010's Soulsville (a tribute to 60's soul songs). In his 50+ & 60+ years, Huey Lewis has performed with Umphrey's McGee, a progressive jam band, billed as Huey Lewis and the Rumors. Lewis sang The Heart of Rock & Roll on 2013's Dancing With the Stars to celebrate the 30th anniversary of the Sports album release and a tour with the News. Lewis has continued to act in small roles in movies and on guest-starring on television series, while contributing to other artists albums. He had a recurring role as Johnny Revere on Hot in Cleveland, and was Jimmy James on One Tree Hill. Huey Lewis and the News still perform over 70 concerts a year, which is impressive when you consider that he's not had perfect health. He had a heart bypass surgery in 2010 at age 60, was diagnosed with atrial fibrillation (irregular heartbeat) and underwent a catheter ablation; and in recent years, arthroscopic surgery to fix a torn meniscus (knee) from a golf injury, and surgery on a torn rotator cuff (from fly fishing). When not on tour, Lewis lives on a 500+ acre ranch in Western Montana; he first began buying land in Montana in 1987 when his young family started vacationing there, and has kept adding to it over the years. "We'll take a nap in the afternoon, that's just part of the fun/So much of youth is wasted on the young/We're not as good as we once were/But we're as good once as we ever were/Tell the kids we'll be late and we'll need time to recuperate/While we're young, let's go out and have some fun." 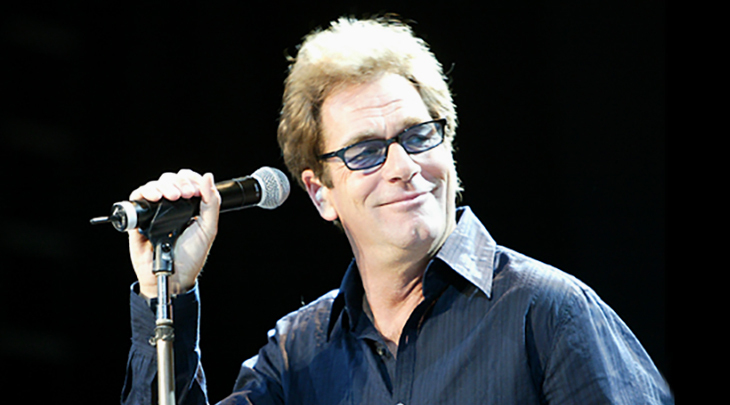 Huey Lewis released a statement in early 2018 that he had been suddenly stricken with hearing loss due to Meniere's disease. Lewis said that although he could hear a little one on one, he couldn't hear well enough to sing. His 2018 tour dates have been cancelled, which is sad news for Huey Lewis and the News fans. Hopefully Lewis will be getting in some quality time golfing and fly fishing while he recuperates. 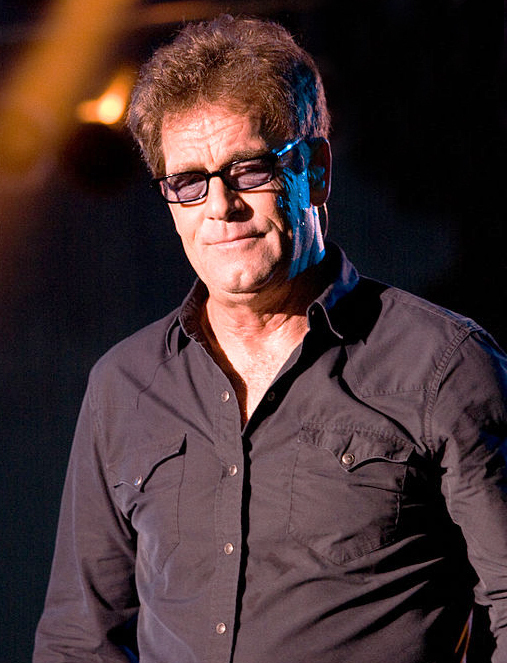 Note: This article was first published in 2015 under the title Celebrating Seniors - Huey Lewis Turns 65. It has been updated with new & additional content.